Us performing at the StoneFort Inn. 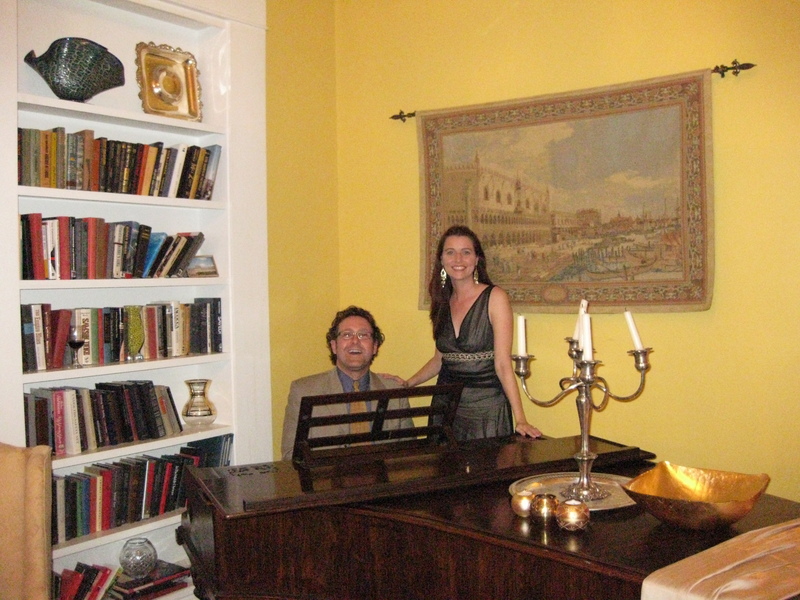 While we wait for the Delta Queen Hotel to open, Laura and I regularly perform at the weekend receptions at the historic StoneFort Inn. This beautiful hotel is owned by Delta Queen Hotel partner Sydney Slome. He and his lovely staff hosted us for quite a while before we moved aboard the boat. It’s been great practice for us in preparing for our lounge performances in the Delta Queen’s Texas Lounge soon. Banjo Bob strumming on the port side Cabin Deck. 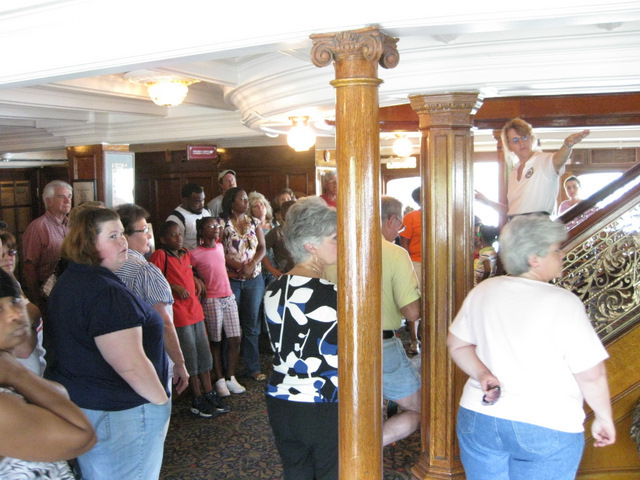 Monday afternoon as the crowds swarmed around the Delta Queen, we were so glad to see a steamboater come aboard. Banjo Bob Stevens came down from Nashville to visit. 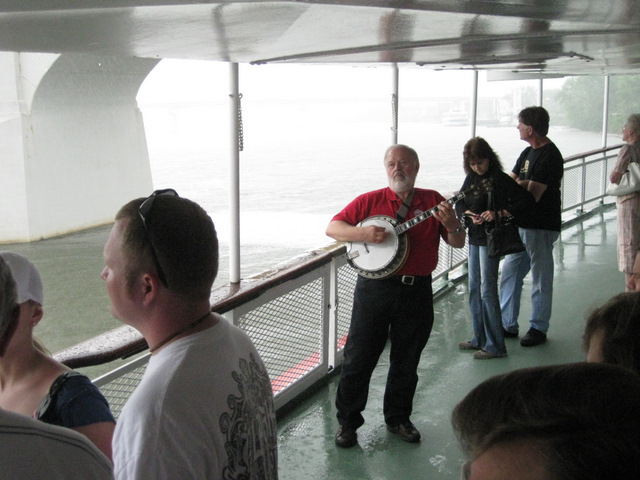 He, of course, had his banjo with him and quickly found a spot on deck to begin entertaining. This was a wonderful addition to the experience and helped occupy guests as they waited for the next tour to begin. Thanks again to Bob for jumping in! Bob and his friend Liz joined Laura and I, Jennifer and her friend Ron and we all headed over to Big River for some refreshment. 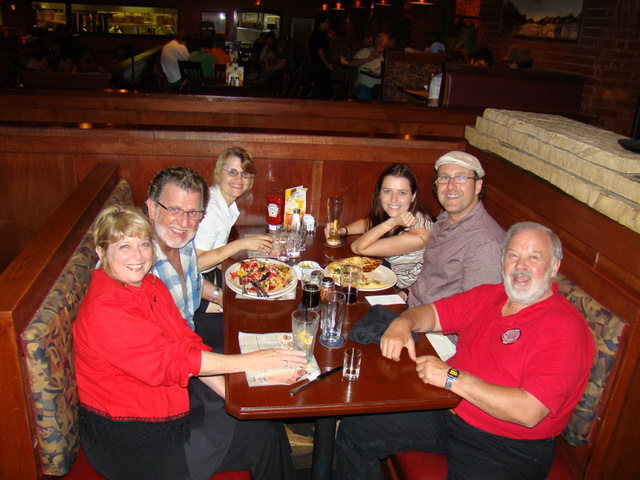 It was a great evening to catch up and reminisce. Liz and Ron kindly endured many a steamboat story. This was a real treat for Jennifer, Laura, and I who daily morn the empty hallways where our friends should be. We miss the crew of the Delta Queen terribly. I walk through the dining room and wonder what Maurice or Darrell are up to. The Purser’s office is a shell without Jonena around to brighten up the boat. Every wall and carpet and piece of furniture misses Lloyd. Will it ever be the same without Bob Schad around? The list could go on for days. Wherever you all are, please know we are missing you and wishing you the best. Jennifer Lemmon working her tour guide magic. Wow, what a weekend! We opened for public tours on Saturday, Sunday and Monday. Laura and I were on a local TV show earlier this week, did an interview on a popular radio talk show, and the paper featured the tours on the cover of their Memorial Day Weekend edition! Needless to say, we were packed. It was crazy. But it was a great opportunity to introduce almost 1,000 people to the lovely Delta Queen. Unfortunately, the boat’s air conditioning is not running yet and it was really hot and stuffy onboard, but Laura, Jennifer Lemmon, and several volunteers helped out in managing the crowds and making sure they all had a great time. That is one terrific positive in the sad situation of the Delta Queen being forced into retirement. 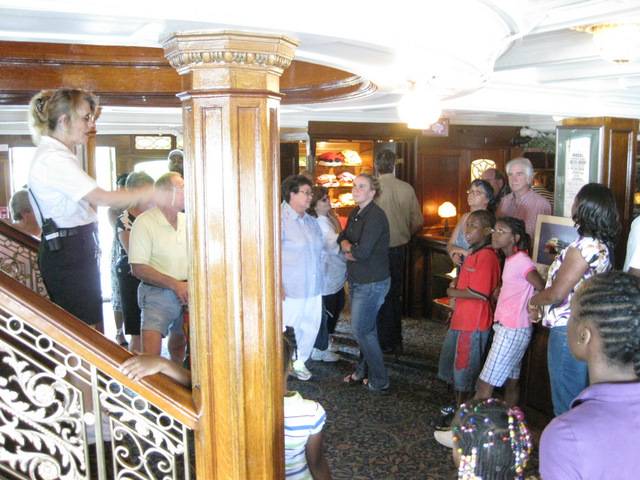 Now, thousands of folks who could never have afforded a cruise will at least be able to come aboard, stay overnight, or enjoy dinner or a drink, and take a tour of the boat, learn about her history and keep this legacy alive. It was a remarkable weekend and everyone seemed very excited about the boat opening on June 5. I know we are! The Chattanooga Times Free Press has been such a terrific supporter of the Delta Queen here in Chattanooga. We are going to open up for public tours for the Memorial Day Weekend and I sent out a press release and sent over a few photos from our recent photo shoot. 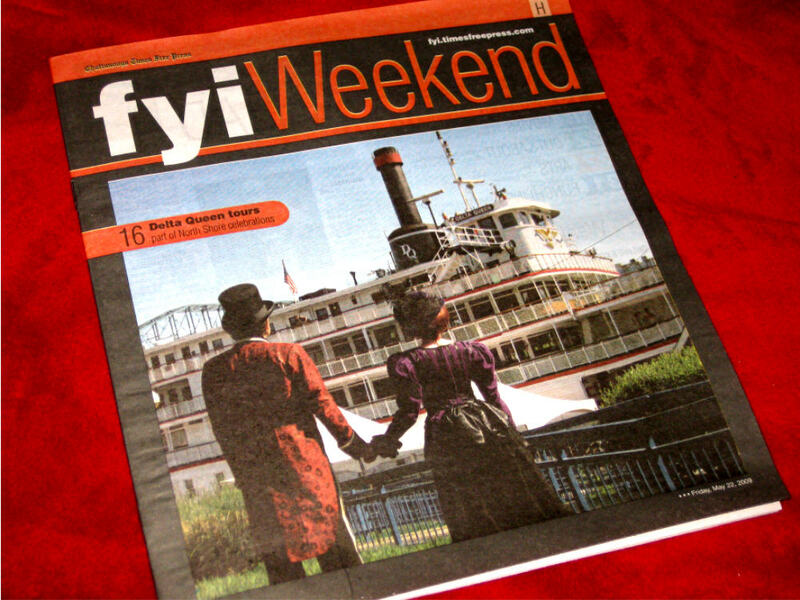 They used us for the cover of the weekend section! Yep, that’s Laura and I in the beautiful costumes from our “Showboat Serenade” show. Much thanks to Jennifer Lemmon who helped in taking this photo. The center spread of the paper had additional photos and focused on the boat’s history and promotion of the tours. We also plan to reawaken the calliope again on Saturday! The huge project of repositioning the stage has now been completed. It now connects the far starboard side of the bow over to the concrete ramp sidewalk at Coolidge Park. Very handy and easy. Here’s a little slide show of some of the pictures I took of this undertaking. Enjoy. Bill and Laura with host Don Welch. Laura and I were invited to appear on the “This and That” show with Don Welch on Chattanooga’s ABC affiliate. We went on to promote the HipFest festival in Coolidge Park this weekend. We’ll perform in the park and the Delta Queen will open for public tours. Big fun! Don’t you think Laura looks like one of those gorgeous newscasters?! I unfortunately look as goofy as ever! Along with the other makeover efforts, even the wheel got a pressure washing and fresh coat of paint. Boy is she red and sparkling!